This new collection of interconnected essays marches to a provocative premise: what if one way to understand your life was to examine the objects within it? Which objects would you choose? What memories do they hold? And lined up in a row, what stories do they have to tell? 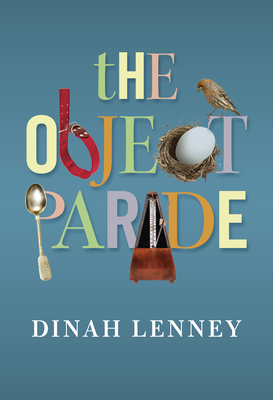 In recalling her experience, Dinah's essays each begin with one thing -- real or imaginary, lost or found, rare or ordinary, animal, vegetable, mineral, edible. Each object comes with a memory or a story, and so sparks an opportunity for rue or reflection or confession or revelation, having to do with her coming of age as a daughter, mother, actor, and writer: the piano that holds secrets to family history and inheritance; the gifted watches that tell so much more than time; the little black dress that carries all of youth's love and longing; the purple scarf that stands in for her journey from New York to Los Angeles, across stage and screen, to pursue her acting dream. Read together or apart, the essays project the bountiful mosaic of life and love, of moving to Los Angeles and raising a family; of coming to terms with place, relationship, failures, and success; of dealing with up-ended notions about home and family and career and aging, too. Taken together, they add up to a pastiche of an artful and quirky life, lovingly remembered, compellingly told, wrapped up in the ties that bind the passage of time. Dinah Lenney is the author of Bigger than Life, published in the American Lives Series at the University of Nebraska Press, and excerpted for the "Lives" column in The New York Times Sunday Magazine. She serves as core faculty for the Bennington Writing Seminars and for the Rainier Writing Workshop, and in the writing program at the University of Southern California. She has played a wide range of roles in theater and television, on shows such as ER, Murphy Brown, Law and Order, Monk, The Sarah Connor Chronicles, and Sons of Anarchy. She lives in Los Angeles.